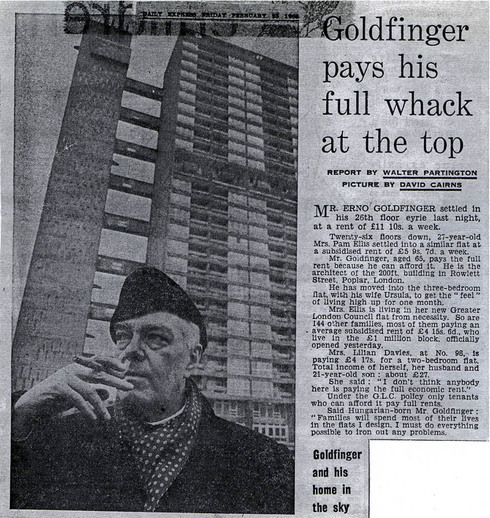 The Goldfingers' stay at Balfron Tower was widely reported in the national press and even reaching Chicago. These can be seen at the Tower Hamlets Archives and in cuttings that Goldfinger collated in scrapbooks at the RIBA Drawings and Archives Collections at the Victoria and Albert Museum. I am sadly unable to share images of these as copyright restrictions apply but I encourage you to visit both sets of archives and have included links to facilitate your visit above and I have transcribed excerpts of this material below. He said he had found only a few snags, and his first week had confirmed his view that tall blocks with open spaces were the “ideal of the moment”. He said the flats had been designed specifically for families with small children. Each flat has a balcony and windows that can be locked. Mrs. Pam Ellis is living in her new Greater London Council flat from necessity. So are 144 other families most of them paying an wavering subsidised rent of £4 15s. 6d., who live in the £1 million block, officially opened yesterday. Mrs. Lilian Davies, at No. 98, is paying £4 17s. for a two-bedroom flat. Total income of herself, her husband and 21-year-old son: about £27. Under the GLC policy only tenants who can afford it pay full rents. Not all architects and sociologists share Mr Goldfinger’s longing for flats, when they are intended for families with children and come in tower block form. Not all tenants of the GLC tower blocks would prefer elevated multi-storey living compared with, say, a Hampstead terrace. Although Mr. Goldfinger is pleased with his flats, some local people have criticised tall blocks, saying they have destroyed the East End community spirit. Architect Mr Erno Goldfinger is to “sample his own cooking” by becoming a tenant for about two months in a skyscraper block of flats he designed for the Greater London Council. A London architect has given tenants of his new high-rise apartment building a change to take any complaints straight to the top. Dissatisfied residents of Balfron Towers in London’s East End may take their complaints to architect Erno Goldfinger’s 25th-floor eyrie. If the problem can be solved, he would do something about it. For two months Mr and Mrs Goldfinger lived in the apartment building. Partly they wanted to find out what technical faults were built into the apartments that could be eliminated from future designs. But their stay was also a sociological experience. It was an attempt to see whether criticism that high-rise buildings were impersonal and unsuitable (especially for families with young children) were justified. Was the experience as he expected it, the architect was asked? “Better than I expected,” he replied. “There is so much nonsense about becoming unsettled in these places,” Mr Goldfinger said. On the contrary, many of the tenants, he said, had made more friends here than in their previous neighbourhood. Mr Goldfinger favours high-rise density in cities because it helps cut down the inflow of traffic from suburban areas. “I am also very opposed to cities eating up the countryside. By creating green spaces around these high-rise buildings we can see that the country comes into the city,” he said. As for mechanical complaints, nearly every day during the Goldfinger’s vigil some one of the 106 families - mostly former slum residents - in the 26 story building complained. Two elevators were inadequate for such a vast building, cried the tenants, especially if one was out of use. No electric doorbells were fitted, and air vents had to be blocked because they collected dust and let in drafts, other tenants lamented. Some of the complaints could not be met. But Mr. Goldfinger gained a wealth of information for the next building he designs. Take those elevators, for instance. He won’t try putting in any more two-elevator systems in very large complexes. Then there were the medal strips fitted around window frames to keep out the draft. “At high winds they rattled terribly,” said Mr. Goldfinger. What then has the Greater London Council learned from Mr. Goldfinger’s experiment? Mr. Goldfinger’s findings are expected to influence the GLC in its redevelopment of London’s old dock area. Life at the top is all bliss to Mr Erno Goldfinger, who has just been enjoying an experimental stay in the 25-floor block he built in the East End for the Greater London Council. His wife would have liked to live in one for ever, she said yesterday. In spite of Mr Goldfinger’s ruthless, James Bondish name, there seems to be justice in his wife’s faith in his powers to make tower-block living reasonably happy. “I advocate high density, high living in London to cut traffic and transport,” he says brushing aside all those “muddle-headed” colleagues who have a feeling that people like their own front doors, to open into the garden. Whom is he trying to fool - himself of us? Does he really think anything of sociological value can be gained in a few weeks? It would take an energetic child that time to get over the novelty of looking down on the world from 200ft. up before he realised that he would be physically separated from it. Does the GLC really have to build this block to find out how long a person will wait for a lift, the effects of the wind, or the layout of the rooms? I do not think so. It does seem extraordinary that we can still go on building 26-storey blocks of flats such as the Poplar one recently shown in the “Guardian.” “Warehouses for storing human beings” was a term used not so long ago by an architectural critic for a similar housing scheme. It seems apt. The regrettable thing is that designers and town-planners should have so lost sight of ordinary human values and basic common sense that they could ever have imagined that a family could have live happily in monsters such as the Poplar block. The main reason for this, I suggest, is that most housing designers today design for “them” - creatures from another planet - seldom for themselves. It can all be done from the safety of a terraced house in Hampstead. And, of course, the old East End terraces - with all their horrors and lack of plumbing - offered more conviviality and less restrictions than the modern tower. As to Mr Fox’s question if the GLC has “to build… to find out about wind,” “layout” etc. - this is simply putting the cart before the horse. His remarks about the power of perception of children are very unjust to children. To reassure himself, he should talk to the people who live in dwellings I have designed and not just theories in vacuo. It does seem extraordinary that we can still go on building 26-storey blocks of flats such as the Poplar one recetly shown in the “Gurardian.” “Warehouses for storing human beings” was a term used not so long ago by an architectural critic for a similar housing scheme. It seems apt. The regrettable thing is that designers and town-planners should have so lost sight of ordinary human values and basic common sense that they could ever have imagined that a family could have live happily in monsters such as the Poplar block.